HAIR! HAIR! HAIR! HAIR! HAIR! HAIR! There’s been a musical about it. The Beatles gained lots of attention for their mop tops. Justin Bieber’s recently-shorn locks earned lots of cash for charity. But if you want to be completely weirded out by hair, have I got a tourist attraction for you. 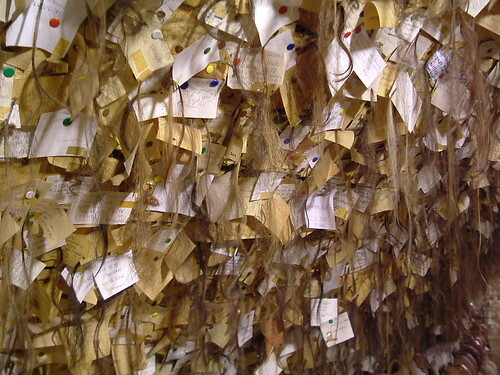 It’s the Hair Museum of Avanos in Cappadocia, Turkey with more than 16,000 samples of women’s hair. Apparently some 30 years ago, potter Chez Galip had a female visitor which the artist truly didn’t want to see leave his shop. She left a lock of her hair as a reminder for Galip along with her full name and address. That was supposedly how it all began. Now the ceiling and walls are covered with enough DNA samples in follicle form to make the CSI folks go crazy. Visitors to the shop and museum aren’t required to leave a memento of their own, but scissors, tape, pens, paper and pins are available to those who would like to help the collection grow. And if the Hair Museum isn’t weird enough for you, if you make a stop in Amsterdam, you might want to visit the Vrolik Museum.